I'm making good progress with my own version of the Milestag UMT software. Since getting the IR receive routine working, I can now control the ISD1790 audio playback chip and have implemented the IR clone and system message processing. I've also implemented most of the game code. This is implemented as a state machine, with each gun mode having its own state. e.g. InGame, Dead, Re-loading, Hit, Game Over etc. The interrupt driven IR receive routine passes a packet event (as a flag) to the foreground task, which then takes the appropriate action depending upon the current game state. 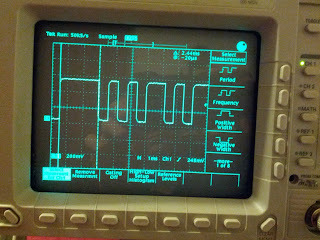 I've also got the IR transmit routine working. 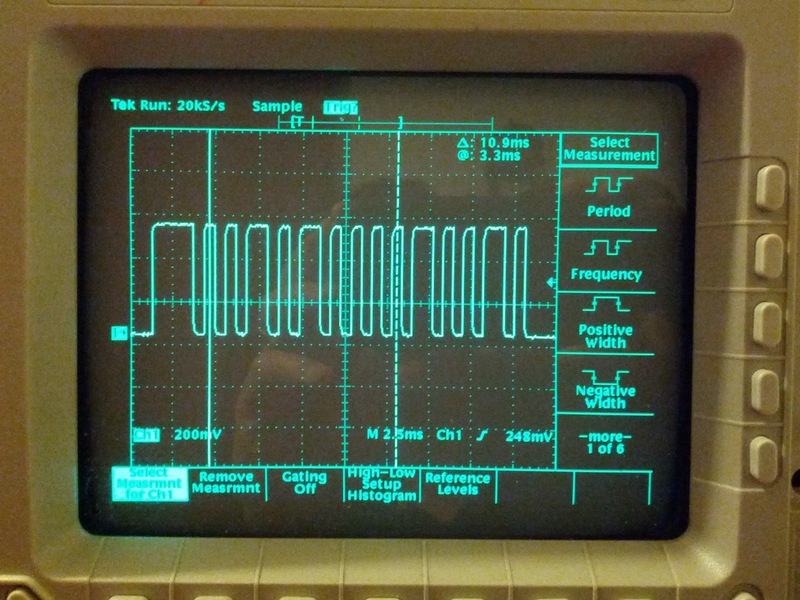 The PIC generates a 600uS periodic interrupt and implements (yet another) state machine to allow it to track which part of the IR signal it is currently sending. The IR packet consists of a 2.4mS header followed by one's of 1200uS and zeros of 600uS. 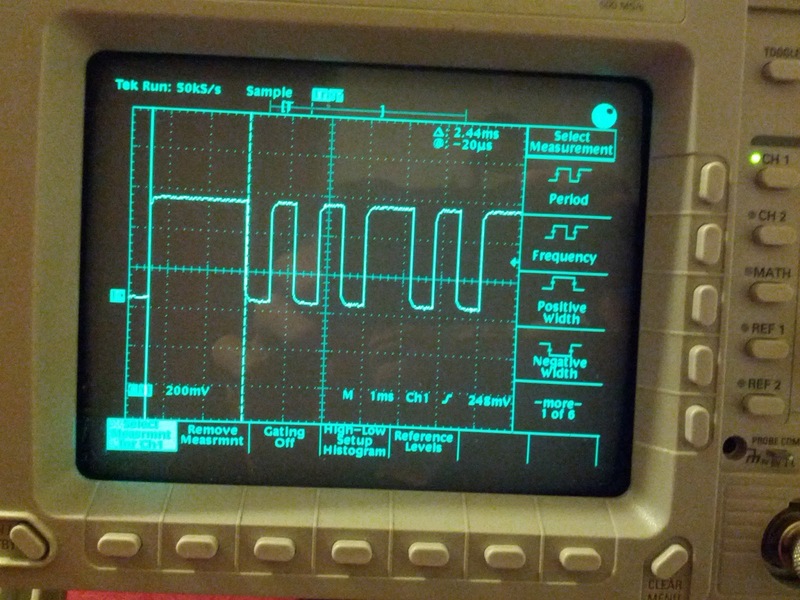 Each bit has an inter bit delay of 600uS. The long header can be seen at the LHS of the display in between the two vertical lines. Following are a series of long and short pulses for 1's and zeros. Here is a full packet sending a gun ID of 20 (0x14) and a team ID of 1, and shot power of 2 (0x12). Data is transmitted least significant bit first. The vertical lines on the show show the start bit (bit 0) of each part of the transmission. The gun ID is 8 bits long and the shot power/team ID is only 6 bits long. See the full Milestag IR protocol documentation here. 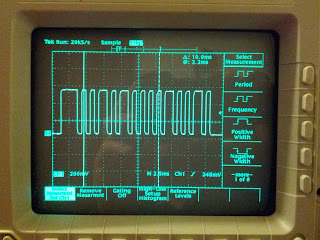 All that remains is to modulate the IR signal to 56kHz using the PICs on board PWM. Great work (and a great blog!). Does the uMT configuration software for the PC also work with your firmware? Or do you need a Core to configure it?